These hand carved lodge doors feature all the things we can do here at ArtFactory.com. We started with a basic castle door, added sidelights to both sides and a transom overhead. Then, our master carvers got to work. They hand carved a giant oak tree, continuing the tree beyond just the door and into the sidelights and transom, matching it perfectly as they went. 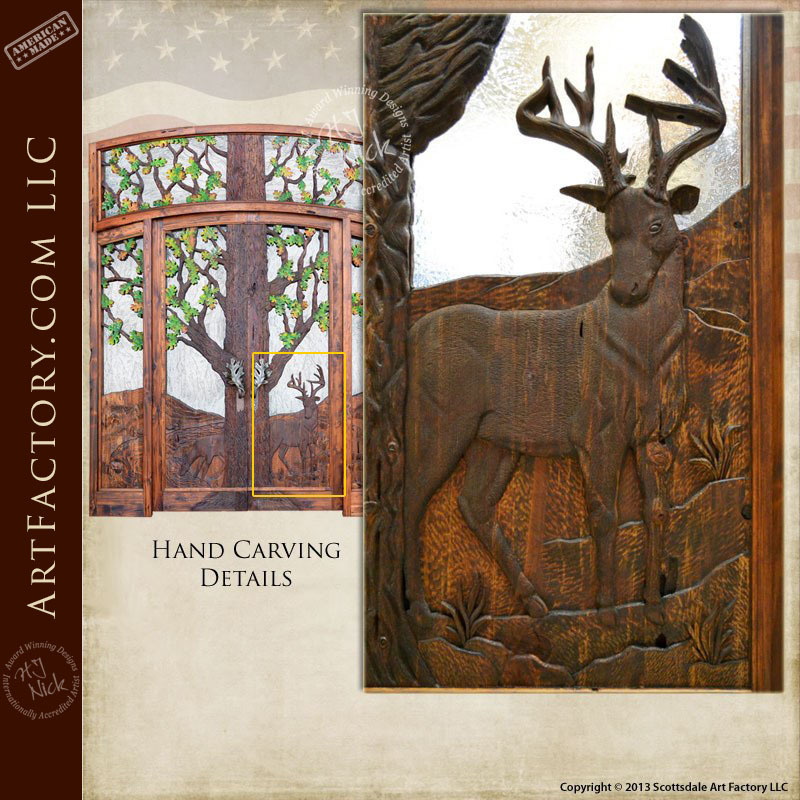 A watchful buck and a doe drinking from a stream were added with rolling hills behind them, again with the full scene spanning across the sidelights and the doors. 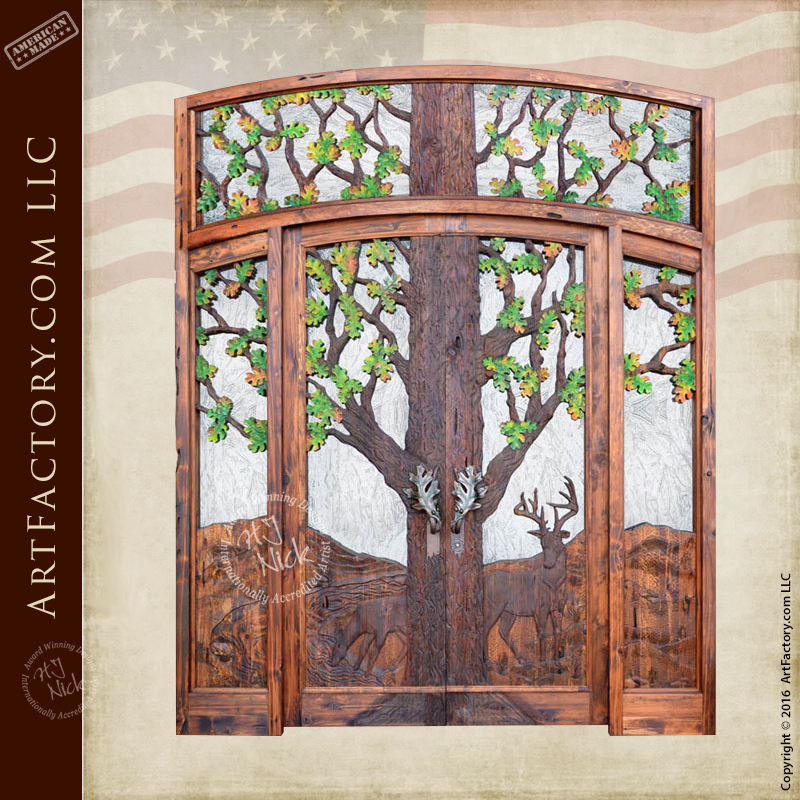 This grand entrance door features a fine art quality nature theme that encompasses every element of the door. Master hand carvings include the heavy detail design of oak tree, leaves, acorns and, deer. These carvings are all done by the hands of one master carver. The carving includes elements such as carved out undersides of leaves that cannot be achieved by machine. We do not use CNC machine, gang carving, or any other fast process. Direct carvings by the hands of one master woodworker are especially relevant in the eyes of appraisers in determining a piece to meet fine art quality specifications. Once the carvers are done with their work, the finishers can start to add the brilliant color. 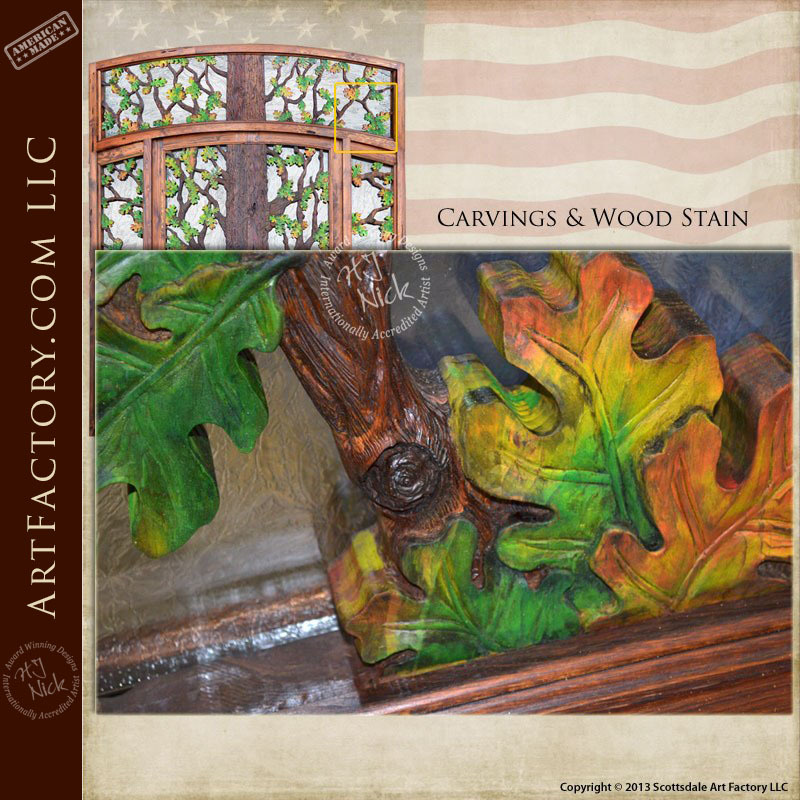 We use a multi-step process to apply our finishes, and the result of that process is displayed here in the bright and vivid color of the oak leaves. We have over 400 color choices or we can color match a sample you provide to match your door's color to your existing doors and furnishings. Our finishing process blends the stain into the grain of the wood. This makes for a finish that wont peel, crack, or chip like painted on finishes. 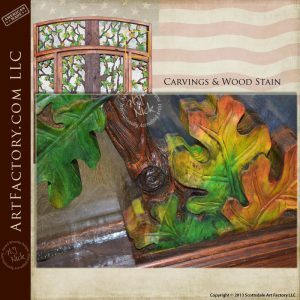 Like our carvings, all of our finishes are of fine art quality. In fact, every aspect of every product that comes out of our factory is inspected to ensure that world class fine art standards are met. Award winning artist H.J. Nick inspects each product, and certifies it to fine art quality with his signature before any product ever ships out. This type of certifications ensures that your product is not only a beautiful work of art today, but will also hold future appreciable investment value in antiquity. 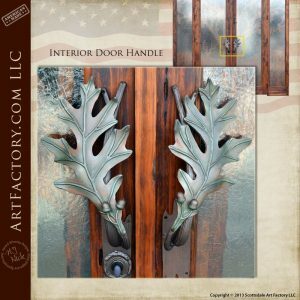 Our master blacksmiths provided the finishing touches on this door's nature theme by hand forging oak leaf door pulls and using our patina process to give them a hint of color as well. All of our doors include fully customizable hardware options, and can be fitted with any of the custom door handles, or theme door pulls from our extensive catalog. Additionally, you can submit your own drawing or hardware design idea, or have us recreate any design from history for you. Our custom hardware options are truly limited only by your imagination. 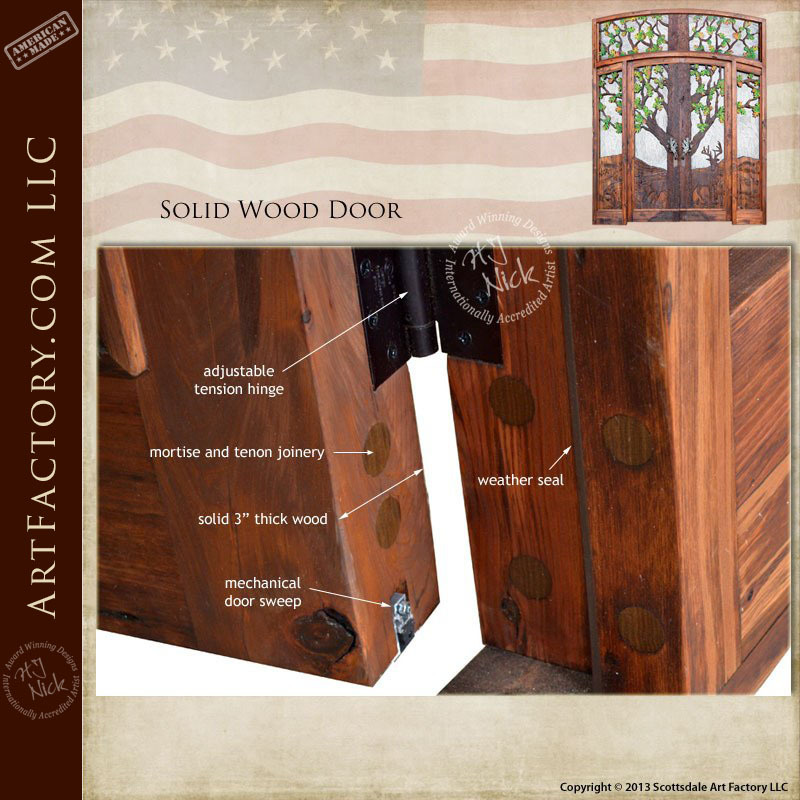 At ArtFactory.com we hand build all of our hand carved lodge doors out of the highest quality materials available. We utilize old world, hand crafting techniques, and hand rubbed finishes to ensure your custom wood door lasts for generations. Request a free consultation with one of our design engineers to discuss your entrance door requirements, and we can create a family heirloom quality custom entrance for your residential or commercial property. Our doors come pre-hung in a solid wood structural jamb that will bolt on to standard metal store fronts. All of our fine art entrance doors are constructed of thick, solid, full length, naturally air dried, timber, and are hand hewn with mortise and tenon joinery. Each door is created in original craft and made in the same hand and materials as the original inspiration from the historic record. Our combination of master hand craftsmanship, and top grade materials allow for us to offer a quality of product that is unmatched anywhere at any price. Never settle for the rest, when you can have the best, only at ArtFactory.com. Call us today for custom door design ideas and pricing at 1-800-292-0008.